Last month, I wrote about the Squall IPA by Dogfish Head Brewery and what a great pairing it made with a full-bodied cigar. It reminded me how the right beer can be as good of an accompaniment to a fine cigar as scotch, bourbon, or rum. Afterwords, I decided to hit the beer store and pick up more IPAs to see if I could find more solid pairings. Unlike the Buds, Millers, and Coors of the world, these beers pack some real flavor. After all, India Pale Ales supposedly got their name because English brewers needed to make a beer strong enough to survive the long trip to India by ship. There’s actually quite a bit of evidence to suggest that common explanation of the name isn’t actually true, but the fact that it is so easily believed is testament to the strong, hoppy characteristics of IPAs. Stone IPA — Made by Stone Brewery in Southern California, this IPA features an orange hue and a citrus nose. It’s a medium-bodied, well-balanced IPA with just the right amount of bitterness. Only recently has this beer been widely available here in the DC area, and I’m glad it has because it goes great with a full-bodied maduro like the Fuente Añejo. Redhook Long Hammer IPA — Made in New Hampshire, this was the mildest of the beers I tried and also my least favorite. Relatively bland for an IPA, it features herbal notes with citrus and clove. Even though it’s not particularly exciting, it drinks easy and goes well with a medium-bodied cigar like the La Arora 107. Victory HopDevil IPA — Crafted at the Pennsylvania Victory Brewing Company, this is a big, flavorful IPA. Slightly less carbonation means the creamy bitterness comes through in a lasting finish. The devilish ale pairs well with a full-flavored Nicaraguan puro like the EO 601 Red Label. Stone Ruination IPA — This flavor bomb proudly claims it will be “ruinous” to your palate. The intense hop punch certainly packs a big whack, but behind the beer’s intimidating front is a flavorful combination of citrus, pine, malt, and grassiness. Enjoy it with a peppery smoke like the Opus X. 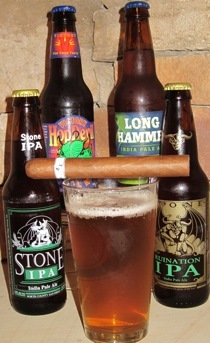 All these beers confirmed (once again) that hoppy, flavorful beers go great with flavorful cigars. Stone IPA has been a favorite of mine since I tried it a few years ago in San Diego. And the Ruination IPA and Victory are now in my regular rotation, when I want bold IPAs to pair with a fine cigar. Got a favorite IPA for pairing with a cigar? Let us know in the comments. Ruination is my hands-down favorite beer, but I can't agree with recommending pairing it with any cigar you're expecting to taste. I love beer and especially IPAs, but I have never enjoyed any beer as much when I am smoking a cigar. I'd rather have a coffee, scotch, bourbon, coffee or water. But I am a huge fan of Ohio's Great Lakes Brewing Co.'s Commodore Perry IPA — just not with a cigar. There is never a time that I don't have a case of Dogfishhead 60 minute IPA in my house. Race car number 5 is also a great one. One of my favorite pairings is a Dogfishhead 60 minute IPA and a 601 blue. IPA all the way. Just downed a bomber of Ruination the other night with a CAO La Traviata. For an hour, my man-cave garage was heaven. ^^And Mike, I am also a fan of Commodore Perry! Here in Columbus, CBC IPA rules supreme in my heart, though. Gotta love Ohio IPAs…! I tend to have a variety of beers and coffee with my cigars … its the stronger spirits that I only partake in occasionally. So great article!! Do more of these! !